The cemetery monument is a permanent memorial that will be visited by generations to come. Choosing a monument involves many decisions. The variety of sizes, shapes, colors and materials are nearly limitless. Selecting a monument is a decision that is both difficult and emotional. We would like to help make that decision, whether At-Need or Pre-Need easier by providing you with the information you need to make a knowledgeable choice in selecting a memorial. Flinch & Bruns Funeral Home, Inc. offers complete monument services including inscriptions for all cemeteries, all expertly done. We unconditionally guarantee the finest materials and craftsmanship. Please contact us at 516-599-3600 for more information. 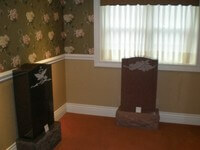 We encourage you to visit our monument studio.